At the Rai law firm, we will do everything we can to accommodate a meeting with you to discuss your case, however we can take walk-in appointments at any time during our regular office hours. The Rai Law Firm is conveniently located at the Plaza Del Sol center on the corner of 13th and I in Downtown Modesto, just blocks away from the historic Modesto Arch. 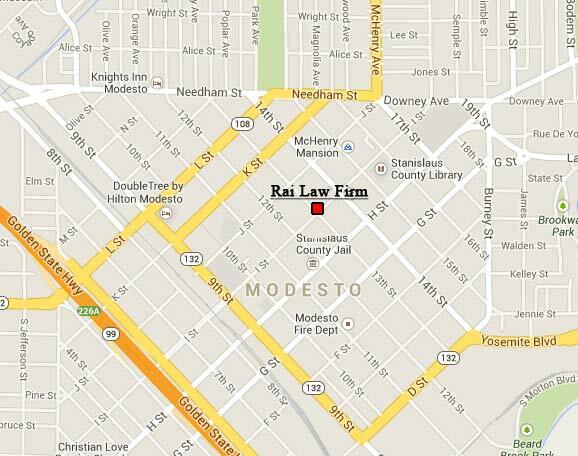 Rai Law Firm, located in Modesto, CA, is a law office that handles cases that include Bankruptcy, Criminal Defense, Family Law, Immigration, Land Use Imminent Domain, Personal Injury and Estate Planning. Lawyer Gurjeet Rai provides legal counsel in the areas of Chapter 7/11/13 bankruptcy, criminal defense cases for felony, misdemeanor, DUI, traffic, and expungement, as well as family law issues such as divorce, restraining orders, child custody and support, alimony, and community property issues. From his office in downtown Modesto, attorney Gurjeet Rai proudly serves all communities in San Joaquin County, including Manteca, Tracy, Lodi, Galt, French Camp, Lathrop, Ripon, Riverbank, Escalon, Mountain House, Morada, Lockeford, Garden Acres, and Country Club. To speak with Gurjeet Rai call (209) 578-5060.